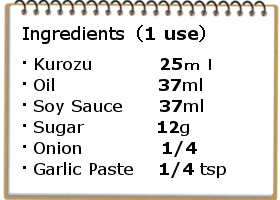 We would like to introduce how to use KUROZ (rice black vinegar) for your healthy menu! I you have interests to KUROZU, please click here. 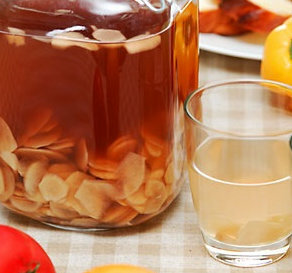 The sourness of vinegar becomes really mild with milk. 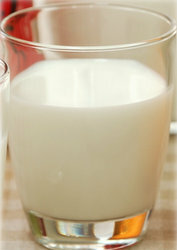 The taste and texture is like yogurt drink and this is perfect for your breakfast to start a day! 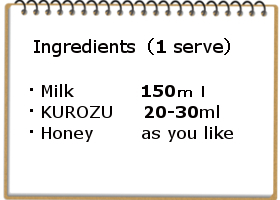 Kurozu helps to take in calcium, so this is the best mix. Simply mix the 3 ingredients in a glass or bottle. Adjust the amount of honey depending on your taste. 1. Peel & slice ginger and put in a sterilized gar. Sprinkle sugar on sliced ginger. 2. 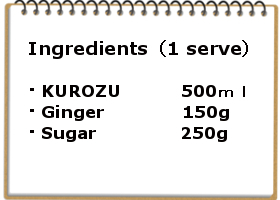 Pour Kurozu to cover ginger and put the lid on. Keep in fridge for more than 3 days. KUROZU matches really well with vegetables! 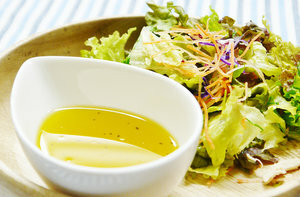 Handmade dressing is yummy and fresh every time to use. 2. Kurozu, soy sauce, sugar, grated onion and garlic paste first. Add the oil at the end and stir well. Pork dish, but not heavy with soft sourness of Kurozu. 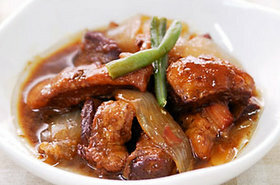 The meat gets tender because of the effect of vinegar. 1. Cut off the pork skin and cut the meat into 4 long blocks. Cut onion into 4 as well. 2. Heat sesame oil in a stew pot and brown around the pork belly blocks. 3. Pour hot water on top of browned meat to remove excess fat. Drain the meat soon. 4. Put back the meat into the pot and place the onion on the top. 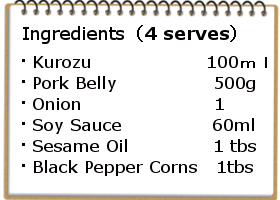 Add Kurozu, soy sauce, black pepper corns and water to cover the meat. Cook with law heat for 30 to 40 mins until the liquid in the pot reduces to half and the meat becomes soft. Serve with thin sliced spring onions, cabbage and karashi(Japanese mustard).